Home milk processing is probably easier than you thought. If you recently acquired dairy goats, or if you're planning to purchase your goat milk from a local dairy farm, there are a few sets of basic skills that you should learn in order to keep your milk fresh-tasting and healthy. We'll cover the basics of handling, processing, and storing your fresh goat milk in this article. If you need any equipment, visit Milk Processing Equipment. For all the basic information on caring for your goat, read the article, How to Raise Goats, from the website www.canningbasics.com. You'll also find a lot of other useful information there on canning and homesteading! If you own your own goats and need information on proper milking and sanitation practices, this article is the place to start. When milking your own goats, remember to always keep a lid over the milk between does, and before further processing and storage. This will reduce foreign particles in the milk, and help prevent the milk from absorbing strong odors. If you regularly perform other chores after milking and before returning the milk to the kitchen, it's a good idea to acquire a small refrigerator for use in the milk room. You can store the collected milk in the refrigerator until you're done, keeping it cool and clean. If you own your own goats, or if you just have an interest in them, you may enjoy reading the articles at the website All Things Goat by Naimhe Jeanne and Martha Ann. If you need help locating local dairy goat farms for purchasing milk, read this article. You may also want to check the listings of dairy farm products at Smalldairy.com. This resource list includes organic, raw milk, and other dairy product suppliers, including some who will process mail orders. If you purchase your milk from a local dairy farmer, it's a good idea to carry an ice chest with ice in which to immediately store the milk when you pick it up. Though most private goat milk sellers are conscientious in following proper milk processing procedures, there is no way to know how long the milk may have stayed at an elevated temperature before your purchase, and the more temperature changes it undergoes, the sooner the spoilage and less appealing the taste. "About Boer Goats and our FARMSTAY BED and BREAKFAST and all you need to know about goats, goats cheese, goats milk and more. Great goat meat recipes and the world’s leading goat information website." Once you've obtained your goat milk from either your own goats or a local farmer, it's time to strain it, and optionally, pasteurize it. Straining the milk removes dust particles and other foreign objects that might affect the taste or texture of the milk. If you only rarely need to strain milk, coffee filters will work. Place a basket-type paper coffee filter in a permanent mesh coffee filter basket and pour the milk through it. This can take awhile, as you have to wait for the milk to drain through before adding more. 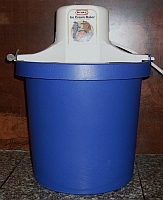 If you don't have a permanent filter basket, you can secure the filter to the bottom of a canning funnel with a large rubber band. More efficient, though more costly, is to purchase a milk strainer specifically made for filtering milk. These are large, funnel-shaped aluminum or stainless steel items that have a disposable filter secured to the bottom with a clamp. The large size allows you to pour a greater quantity of milk at a time, and the filter allows a much quicker rate of flow than coffee filters. If you intend to process milk regularly, investing in a milk strainer is highly recommended. If you intend to pasteurize your milk, (covered in the headline article), you can strain it directly into your pot for pasteurizing. Just be careful that the container from which you're pouring does not have any debris on the outside of it that could fall into the pot and contaminate the milk. The rate at which goat milk is cooled to its proper storage temperature of 40° Fahrenheit or lower has an impact on two important factors: taste and spoilage rate. For raw goat milk, bringing the temperature down quickly also aids in preventing the growth of bacteria. When milk is heated for pasteurization, rapid cooling helps to ensure the best taste possible. I've found that the best way for cooling small quantities of goat milk for home milk processing is with an electric ice cream freezer. Using an ice cream freezer, I have consistently brought milk from its pasteurized temperature of 165° Fahrenheit to 40° Fahrenheit in under 20 minutes, which is Grade A standard. All other cooling methods I've used, including ice water baths and freezer storage, took much longer to achieve the 40° mark, and resulted in a slight off-taste for the milk. The ice cream freezer method, however, produced milk that was indistinguishable in taste from commercially processed milk. Goat milk should be stored in containers that have been thoroughly washed and sanitized. Although aluminum and plastic containers are considered acceptable, I prefer either stainless steel or glass, because these are less likely to harbor bacteria or residue that will affect the taste of the milk. Milk containers and utensils can be sterilized by either soaking in bleach water (1/8 cup bleach to 1 gallon of water) or by boiling for several minutes. Finish by letting the containers air dry. When cleaning containers that have held milk, rinse first in cool water, then finish with a wash in hot, soapy water. This pre-rinsing helps prevent the buildup of a film called milk stone caused by the protein in the milk. If milk stone has already formed on your containers or equipment, you can purchase a commercial acid cleaner made specifically for removing it. Once the milk is cooled, it should be stored in the refrigerator. In general, milk should not be stored on the refrigerator door, since this area is exposed to much more heat and temperature changes than the shelf areas. If you can't use your goat milk right away, you may be interested in freezing it to use later. Although freezing milk isn't complicated, this article will give you pointers to help make sure your frozen milk tastes as fresh as possible. After collection, during transport, and in storage, milk should always be covered to prevent dirt and bacterial contamination and to prevent the milk from absorbing strong odors that will affect the taste. Filter milk to remove foreign particles and contaminants, and always use clean, disinfected containers for holding and storing milk. Temperatures above 40° Fahrenheit allow bacteria to grow, promoting quicker spoilage and lowering the quality of taste. Cool milk as rapidly as possible, and then keep it cold! Careful handling and processing of milk can make an enormous difference in the taste and quality of your goat milk. Take time to always follow the simple guidelines for good milk processing practices, and you'll be rewarded with delicious, healthy milk for drinking and making fabulous goat milk products! Want more articles on home milk processing? Let us know by taking our quick preference survey! Articles are updated frequently, so check back here for any new information related to home milk processing! Get the 214-page Everything Goat Milk Ebook! Are you new to raising goats? Learn vital information in this downloadable ebook! The BEST and EASIEST method for growing your own delicious organic food! Get a FREE recipes ebook when you sign up for our newsletter!